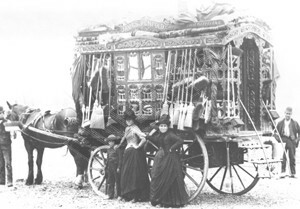 These living vans were used by itinerant vendors and were unique in several ways. An obvious point is that the door is at the rear, unlike any other caravan type. This feature was useful because it gave easy access to the van without having to unharness the horse. As well as the normal rib and plank contruction body shell, there is an outer layer of cupboards and shelves with beautifully carved rails and spindles surrounding the body. The roof rack was reached by a ladder, usually stowed under the waggon, and was loaded with light but bulky items such as baskets and small chairs. 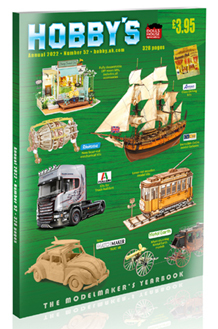 The Brush Waggon is the perfect subject for the model maker who enjoys small scale woodcarving and the plans show the exact construction of the racks in enlarged detail.